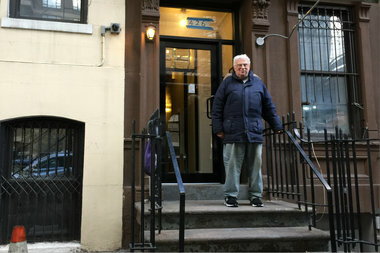 Charles Fernandez stands outside the building in which he has lived since 1959. He fears the demolition of a neighboring building could damage his home and force him out off the block of East 58th Street where he has lived his entire life. SUTTON PLACE — Charles Fernandez has lived on East 58th Street his entire life so, when a developer offered the 70-year-old a deal to move out of his rent stabilized apartment and into a condo three blocks away, he said no. Fernandez's home at 426 E. 58th St. sits next to the site of Bauhouse Group's upcoming 900-foot residential tower. Demolition of several buildings on his block is set to begin to make way for the new development. While his is not one of them being razed, Fernandez said the threat to his home is real. Bauhouse bought up three properties at 428-432 E. 58th St. earlier this year, while only purchasing the air rights of Fernandez's building at 426. The developer offered to move Fernandez to a condo nearby, where he'd pay $1 a month for rent, he said. But Fernandez, who's lived in his apartment since 1959, refused the offer, along with his sister who lives in another unit in the building. The developer eventually backed off and hasn't made any attempt to purchase 426. But now Fernandez is concerned that the impending demolition of the building next door will end up damaging his home to the point that he won't be able to live there anymore — a concern echoed in a letter to the city's Department of Buildings from Councilman Ben Kallos in October. "Please scrutinize the applications to demolish 428 and 430 East 58th Street and do not approve unless it can be proved that the structural integrity of 426 East 58th Street will not be compromised," Kallos writes in the letter. Neighbors of the planned tower have fought the Bauhouse project, saying it doesn't fit with the neighborhood and will cast shadows over their homes. But Fernandez said he's more concerned about the impact of the construction itself. “They could build the Egyptian pyramids there and I wouldn’t care,” he said. “I just want to stay in my home. I was born and raised here and I don’t want to move." The city approved the demolition permits for 428-432 E. 58th St. in July and September, and Bauhouse announced this week that it would now begin the process of tearing down the buildings, one of which sits flush against Fernandez's home. The walls between 428 and 426 E. 58th St. are so thin that Fernandez said he used to be able to hear the neighbors talking in their apartment. Even minor work in one building impacted the other, he added. When plumbers did work on Fernandez’s bathroom, it shook plaster loose in the neighbor’s apartment, he said. Fernandez sent a letter to the Department of Buildings in September raising concerns about the demolition. The agency has not replied to the letters from Fernandez and Kallos, they said. A DOB spokesman did not respond to a request for comment regarding the letters or specifics on this particular project, but noted that the agency has a dedicated unit that is responsible for reviewing demolition requests and performing safety inspections. "All permit applications for demolitions that occur adjacent to existing buildings must demonstrate that safeguards will be implemented to protect neighboring properties and the public," said DOB spokesman Alex Schnell in a statement. "In addition, Department inspectors will conduct a thorough review of the site prior to the issuance of any work permits." A spokeswoman for Bauhouse assured that the developer would be taking measures to mitigate any impact on neighboring buildings at the site. "We will be using an expert team for the routine demolition of 428-432 E. 58th St. and do not anticipate any damage to the surrounding environment," the spokeswoman said. Still, Kallos said he will watch the project closely for any foul play. “I am watching closely for any kind of activity that could cause harm to adjacent buildings, which would just so happen to work in the developer’s favor,” Kallos told DNAInfo.